Oppo N1 Mini has been in our rumor mill for a very long time until Oppo decided to make it official in the end of May. Then we learnt the N1 Mini will be one pricey smartphone at CNY2,699 or $435. Today Oppo has released yet another teaser for the Oppo N1 Mini. Unfortunately it doesn't say much on the specs and we are still very much in the dark, despite the phone being "official" for a few months now. The official Facebook post says: "Revolutionary 24 Mega Pixels Ultra HD Camera, Coming Soon!" The Ultra HD camera is in fact a 13MP Sony 6-element lens camera with a 1/3.2" sensor size. 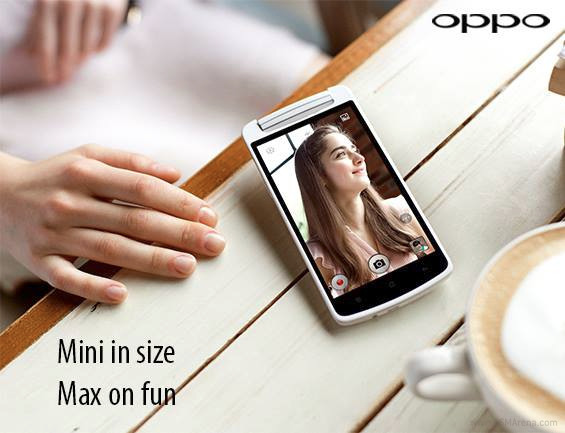 The camera features the Super Zoom mode (introduced with the Oppo Find 7), but in the N1 Mini it works at 24MP, not 50MP. Here is hoping Oppo will finally detail the N1 Mini specs and its availability. Thank you, Ezhilvadivel, for the tip!